Moving can be a difficult process. By the time you’ve packed up your old home and moved the boxes into your new one, you may swear never to move ever again. 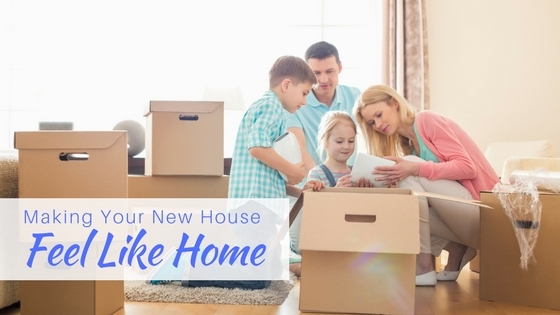 It’s easy to feel overwhelmed by the thought of unpacking and organizing your new home, but by using some of these simple tips, you can begin to make your new home feel more like your home. Since bathrooms are smaller, setting them up first will give you a sense of accomplishment that will carry over into the other rooms. Everyone will need the bathroom at some point and will appreciate not having to look through a myriad of boxes for toilet paper, soap and towels! Moving is hard for everyone but it can be even harder for kids to adjust. Help them get used to their new surroundings by making it a priority to unpack and setup their rooms. This will give them something familiar in an unfamiliar place and ease any anxieties. Make the beds and stock the closets. The quick way to feeling more at home in a new house is to set up your bedrooms, but if you’re not able to get those completely in order, a shortcut is to make the beds and stock your closets. It’s rare that a home is fully unpacked and set up in the day so being able to sleep in your bed and easily find your clothes will boost morale after a long day of moving. Aside from your kids’ bedrooms, pick a room that will instantly make you feel more at home once it’s set up, whether it’s the kitchen, living room or another room, and get that organized. This will help you to feel more comfortable in your new place. Avoid the temptation to leave empty boxes where they lay. Breakdown and put your empty boxes up as soon as possible to help welcome in a more settled feeling into your home. Moving and redecorating a new home is a long-process and it’s okay if it’s not done that first day (or even the second or even the seventh day!). It may take some time to get the window treatments up or your art on the walls but if you try following these five simple tips, you can start turning your new house into a cozy, happy home. If you’re interested in moving to a new home in the San Francisco Bay Area, check out our current communities and available home inventory on SummerHillHomes.com. We look forward to welcoming you home!